The half-angle of the cone (a) within which incident light is totally internally reflected by the fiber core. It is equal to sin-1(NA). Abbreviation for American standard code for information interchange. An encoding scheme used to interface between data processing systems, data communication systems, and associated equipment. 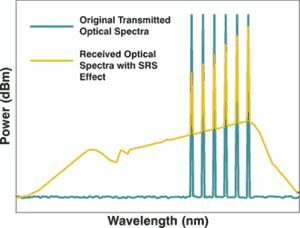 The decrease in signal strength along a fiber optic waveguide caused by absorption and scattering. Attenuation is usually expressed in dB/km. 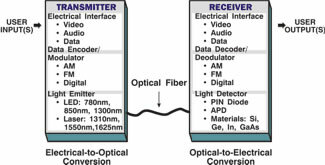 A device, built with silicon planar lightwave circuits (PLC), that allows multiple wavelengths to be combined and separated in a dense wavelength-division multiplexing (DWDM) system. The return of a portion of scattered light to the input end of a fiber; the scattering of light in the direction opposite to its original propagation. The range of frequencies within which a fiber optic waveguide or terminal device can transmit data or information. Of an optical fiber, under specified launching and cabling conditions, at a specified wavelength, a figure of merit equal to the product of the fiber’s length and the 3 dB bandwidth of the optical signal. The bandwidth•distance product is usually stated in megahertz • kilometer (MHz•km) or gigahertz•kilometer (GHz•km). It is a useful figure of merit for predicting the effective fiber bandwidth for other lengths, and for concatenated fibers. An optical device, such as a partially reflecting mirror, that splits a beam of light into two or more beams. 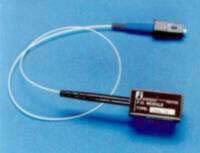 Used in fiber optics for directional couplers. The logarithm to the base 10 of a power ratio, expressed as: B = log10(P1/P2), where P1 and P2 are distinct powers. The decibel, equal to one-tenth bel, is a more commonly used unit. 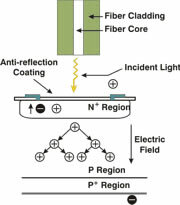 1) In optical fiber, a protective coating applied directly to the fiber (illustrated). 2) A routine or storage used to compensate for a difference in rate of flow of data, or time of occurrence of events, when transferring data from one device to another. The ability of a station to isolate itself optically from a network while maintaining the continuity of the cable plant. Abbreviation for the speed of light. 299,792.5 km per second in a vacuum. Reduced fiber bandwidth caused by different wavelengths of light traveling at different speeds down the optical fiber. Chromatic dispersion occurs because the speed at which an optical pulse travels depends on its wavelength, a property inherent to all optical fiber. May be caused by material dispersion, waveguide dispersion, and profile dispersion. CWDM allows eight or fewer channels to be stacked in the 1550 nm region of optical fiber, the C-Band. 1) A cable consisting of a center conductor surrounded by an insulating material and a concentric outer conductor and optional protective covering. 2) A cable consisting of multiple tubes under a single protective sheath. This type of cable is typically used for CATV, wideband, video, or RF applications. 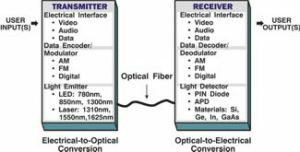 In fiber optics, a communication system where the output of a local laser oscillator is mixed optically with a received signal, and the difference frequency is detected and amplified. 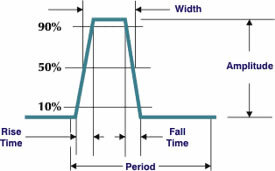 A process in which the dynamic range or data rate of a signal is reduced by controlling it as a function of the inverse relationship of its instantaneous value relative to a specified reference level. Compression is usually accomplished by separate devices called compressors and is used for many purposes such as: improving signal-to-noise ratios, preventing overload of succeeding elements of a system, or matching the dynamic ranges of two devices. Compression can introduce distortion, but it is usually not objectionable. 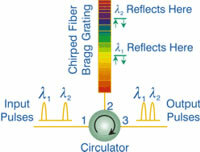 The light-conducting central portion of an optical fiber, composed of material with a higher index of refraction than the cladding. The portion of the fiber that transmits light. An optical device that combines or splits power from optical fibers. A technique of measuring optical fiber attenuation by measuring the optical power at two points at different distances from the test source. In single-mode fiber, the wavelength below which the fiber ceases to be single-mode. 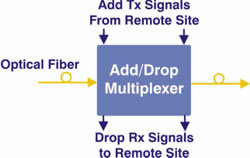 A module that separates two or more signals previously combined by compatible multiplexing equipment. The transmission of many of closely spaced wavelengths in the 1550 nm region over a single optical fiber. Wavelength spacings are usually 100 GHz or 200 GHz which corresponds to 0.8 nm or 1.6 nm. DWDM bands include the C-Band, the S-Band, and the L-Band. An optical filter that transmits light according to wavelength. Dichroic filters reflect light that they do not transmit. Used in bulk optics wavelength-division multiplexers. The temporal spreading of a light signal in an optical waveguide caused by light signals traveling at different speeds through a fiber either due to modal or chromatic effects. A type of single-mode fiber designed to have zero dispersion near 1550 nm. This fiber type works very poorly for DWDM applications because of high fiber nonlinearity at the zero-dispersion wavelength. 1) Multimode fibers optimized for 850 nm and 1310 nm operation. 2) Single-mode fibers optimized for 1310 nm and 1550 nm operation. A station that offers two attachments to the FDDI network which are capable of accommodating a dual (counter-rotating) ring. Abbreviation for Electronic Industries Association. An organization that sets video and audio standards. The range of frequencies of electromagnetic radiation from zero to infinity. Any electrical or electromagnetic interference that causes undesirable response, degradation, or failure in electronic equipment. Optical fibers neither emit nor receive EMI. Optical fibers doped with the rare earth element, erbium, which can amplify light in the 1550 nm region when pumped by an external light source. Light guided in the inner part of an optical fiber’s cladding rather than in the core, i.e. the portion of the light wave in the core that penetrates into the cladding. In a fiber optic coupler, the optical loss from that portion of light that does not emerge from the nominal operation ports of the device. In a fiber interconnection, that portion of loss not intrinsic to the fiber but related to imperfect joining of a connector or splice. Abbreviation for fiber distributed data interface. 1) A dual counter-rotating ring local area network. 2) A connector used in a dual counter-rotating ring local area network (illustrated). A rigid tube that confines or holds a fiber as part of a connector assembly. A component installed in a fiber optic transmission system that reduces the power in the optical signal. It is often used to limit the optical power received by the photodetector to within the limits of the optical receiver. 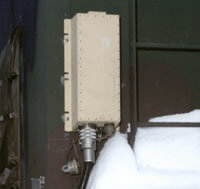 A fiber optic attenuator may be an external device, separate from the receiver, or incorporated into the receiver design as illustrated (far left). Fiber optic service to a node that is located in a neighborhood. Fiber optic service to a node connected by wires to several nearby homes, typically on a block. Fiber optic service to a node located inside an individual home. An industry-standard specification that originated in Great Britain which details computer channel communications over fiber optics at transmission speeds from 132 Mb/s to 1062.5 Mb/s at distances of up to 10 kilometers. A bundle of fibers fused together so they maintain a fixed alignment with respect to each other in a rigid rod. Optical fiber in which the refractive index of the core is in the form of a parabolic curve, decreasing toward the cladding. Noise that results when equipment is grounded at points having different potentials thereby creating an unintended current path. 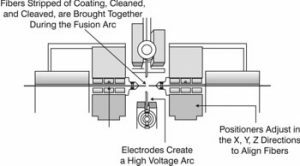 The dielectric properties of optical fiber provide electrical isolation that eliminates ground loops. 1) The velocity of propagation of an envelope produced when an electromagnetic wave is modulated by, or mixed with, other waves of different frequencies. 2) For a particular mode, the reciprocal of the rate of change of the phase constant with respect to angular frequency. 3) The velocity of the modulated optical power. A bidirectional link that is limited to one-way transfer of data, i.e., data cannot be sent both ways at the same time. Also referred to as simplex transmission. An optical fiber having a silica core and a hard polymeric plastic cladding intimately bounded to the core. A transmission system or cable construction (illustrated) that incorporates both fiber optic transmission components and copper coax transmission components. A fluid whose index of refraction nearly equals that of the fibers core. Used to reduce Fresnel reflection loss at fiber ends. Also known as index-matching gel. Colloquially, optical fibers with best transmission at wavelengths of 2 mm or longer, made of materials other than silica glass. See also fluoride glasses. 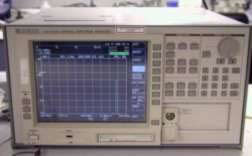 An instrument that uses the principle of interference of electromagnetic waves for purposes of measurement. Used to measure a variety of physical variables, such as displacement (distance), temperature, pressure, and strain. Noise generated in optical fiber caused by the distributed backreflection that all fiber generates mainly due to Rayleigh scattering. 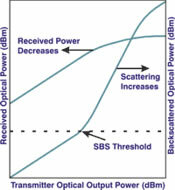 OTDRs make use of this scattering power to deduce the fiber loss over distance. Fiber optic sensors that rely on interferometric detection. Splice losses arising from differences in the fibers being spliced. A short fiber optic cable with connectors on both ends. Usually, a fiber with a core of 200 µm or more. In a strict sense, the region of the electromagnetic spectrum that can be perceived by human vision, designated the visible spectrum, and nominally covering the wavelength range of 0.4 µm to 0.7 µm. In the laser and optical communication fields, custom and practice have extended usage of the term to include the much broader portion of the electromagnetic spectrum that can be handled by the basic optical techniques used for the visible spectrum. This region has not been clearly defined, but, as employed by most workers in the field, may be considered to extend from the near-ultraviolet region of approximately 0.3 µm, through the visible region, and into the mid-infrared region to 30 µm. Use of optical fibers to illuminate. A type of fiber optic cable construction where the fiber is contained within a loose tube in the cable jacket. An accounting of overall attenuation in a system. See optical link loss budget. 1) Reduction of the storage size of digital data by employing one or more appropriate algorithms in such a way that the data can be recover without loosing integrity. 2) Reduction of the amount of data that needs to be transmitted per unit time though an analogous real-time process that does not compromise the ability to completely restore the data. Dispersion resulting from the different velocities of each wavelength in a material. An optical fiber splice accomplished by fixtures or materials, rather than by thermal fusion. The capillary splice, illustrated, is one example of a mechanical splice. A single electromagnetic wave traveling in a fiber. The dynamic process a multilongitudinal mode laser undergoes whereby the changing distribution of power among the modes creates a continuously changing envelope of the laser’s spectrum. A measure of distribution of optical power intensity across the end face of a single-mode fiber. A device that removes cladding modes. An optical fiber that has a core large enough to propagate more than one mode of light The typical diameter is 62.5 micrometers. A device that combines two or more signals into one output. The process by which two or more signals are transmitted. 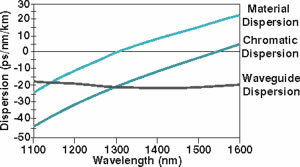 The part of the infrared near the visible spectrum, typically 700 nm to 1500 nm or 2000 nm; it is not rigidly defined. 1) A terminal of any branch in network topology or an interconnection common to two or more branches in a network. 2) One of the switches forming the network backbone in a switch network. 3) A point in a standing or stationary wave at which the amplitude is a minimum. A dispersion-shifted single-mode fiber that has the zero-dispersion wavelength near the 1550 nm window, but outside the window actually used to transmit signals. This strategy maximizes bandwidth while minimizing fiber nonlinearities. The light-gathering ability of a fiber; the maximum angle to the fiber axis at which light will be accepted and propagated through the fiber. NA = sin a, where a is the acceptance angle. NA also describes the angular spread of light from a central axis, as in exiting a fiber, emitting from a source, or entering a detector. Abbreviation for optical carrier. A carrier rate specified in the SONET standard. A device that amplifies an input optical signal without converting it into electrical form. The best developed are optical fibers doped with the rare earth element, erbium. See also EDFA. A device that allows the details of a region of an optical spectrum to be resolved. Commonly used to diagnose DWDM systems. Another name for optical fiber. 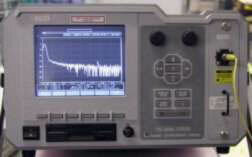 An instrument that locates faults in optical fibers or infers attenuation by backscattered light measurements. An optical fiber having a plastic core and plastic cladding. The air handling space between walls, under structural floors, and above drop ceilings, which can be used to route intrabuilding cabling. A cable whose flammability and smoke characteristics allow it to be routed in a plenum area without being enclosed in a conduit. Transmission between two designated stations. Fiber designed to propagate only one polarization of light that enters it. 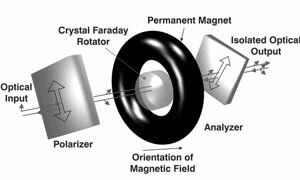 Polarization mode dispersion is an inherent property of all optical media. It is caused by the difference in the propagation velocities of light in the orthogonal principal polarization states of the transmission medium. The net effect is that if an optical pulse contains both polarization components, then the different polarization components will travel at different speeds and arrive at different times, smearing the received optical signal. The glass rod from which optical fiber is drawn. The changing of direction of a lightwave in passing through a boundary between two dissimilar media, or in a graded-index medium where refractive index is a continuous function of position. A property of optical materials that relates to the speed of light in the material versus the speed of light in a vacuum. The description of the value of the refractive index as a function of distance from the optical axis along an optical fiber diameter. Also called refractive index profile. Cables in which many fibers and/or copper wires are embedded in a plastic material in parallel, forming a flat ribbon-like structure. The change of direction of light rays or photons after striking small particles. It may also be regarded as the diffusion of a light beam caused by the inhomogeneity of the transmitting material. Transmission in one direction only. Also referred to as half-duplex transmission. An optical loss test set for use with single-mode fiber. Also smart skins. Materials containing sensors (fiber optic or other types) to measure their properties during fabrication and use. A permanent connection of two optical fibers through fusion or mechanical means. The ratio of power emerging from two output ports of a coupler. An LED or laser diode that emits light with a controlled and constant spectral width, center wavelength, and peak power with respect to time and temperature. Fiber that has a uniform index of refraction throughout the core that is a step below the index of refraction in the cladding. The easiest fiber nonlinearity to trigger. When a powerful light wave travels through a fiber it interacts with acoustical vibration modes in the glass. This causes a scattering mechanism to be formed that reflects much of the light back to the source. A fiber nonlinearity similar to SBS but having a much higher threshold. This mechanism can also cause power to be robbed from shorter wavelength signals and provide gain to longer wavelength signals. A cable that carries several video channels between facilities of a cable television company. The reflection that occurs when light strikes an interface at an angle of incidence (with respect to the normal) greater than the critical angle. 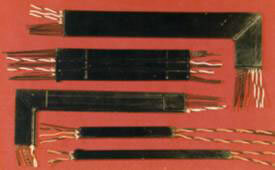 A cable made up of one or more separately insulated twisted wire pairs, none of which is arranged with another to form quads. Abbreviation for Underwriter’s Laboratory. An organization that tests product safety for a wide variety of products. UL approved products carry the symbol shown at right. Abbreviation for Watt. A linear measurement of optical power, usually expressed in milliwatts, microwatts, and nanowatts. A material medium that confines and guides a propagating electromagnetic wave. In the microwave regime, a waveguide normally consists of a hollow metallic conductor, generally rectangular, elliptical, or circular in cross-section. This type of waveguide may, under certain conditions, contain a solid or gaseous dielectric material. In the optical regime, a waveguide used as a long transmission line consists of a solid dielectric filament (fiber), usually circular in cross-section. In integrated optical circuits an optical waveguide may consist of a thin dielectric film. In the RF regime, ionized layers of the stratosphere and the refractive surfaces of the troposphere may also serve as a waveguide. The part of chromatic dispersion arising from the different speeds light travels in the core and cladding of a single-mode fiber (i.e., from the fiber’s waveguide structure). Sending several signals through one fiber with different wavelengths of light. 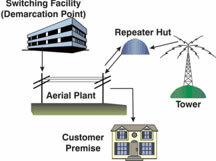 A network or terminal that uses electromagnetic waves, such as RF, infrared, laser, visible light, and acoustic energy, not wires, for telecommunications. The collection of millions of graphical pages that heavily utilize HTML to provide access to information. One of the key components of the Internet. 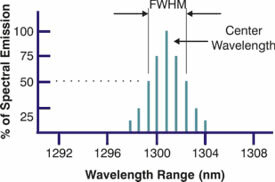 In single-mode fiber, the rate of change of dispersion with respect to wavelength, at the fiber’s zero-dispersion wavelength. In a single-mode optical fiber, the wavelength at which material dispersion and waveguide dispersion cancel one another. 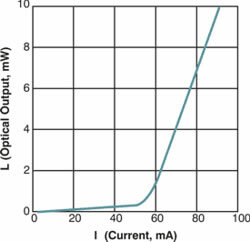 The wavelength of maximum bandwidth in the fiber. Also called zero-dispersion point.